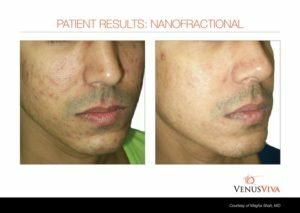 The Nano Fractional RF Skin Resurfacing treatment is the ultimate skin rejuvenation solution for deep wrinkles, acne scars, large pores, uneven texture, pigmentation irregularities and stretch marks. We utilize the Venus Viva™ which operates the revolutionary NanoFractional Radio Frequency™(RF) and SmartScan™ technology that delivers superior results through a selectional dermal heating process, with minimal discomfort for enhanced patient comfort. The use of NanoFractional RF™ delivers energy deep in to the dermis generating heat, injuring existing collagen, this stimulates the body’s own healing response, which is the production of new collagen. This process is what repairs signs of skin damage seen on the surface of the skin. 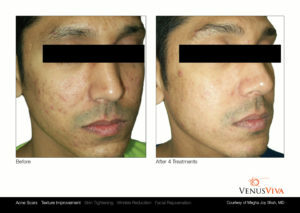 The result is healthy, regenerated, and fresher looking skin. This treatment is much more comfortable than lasers or chemical peels, safe for all skin types, non-invasive, and effective with long-term results. With minimal downtime, you can expect to have clearer, smoother, younger, and healthier rejuvenated skin after one treatment. Full results are seen with a series of 3-4 sessions, one treatment every 4-6 weeks. 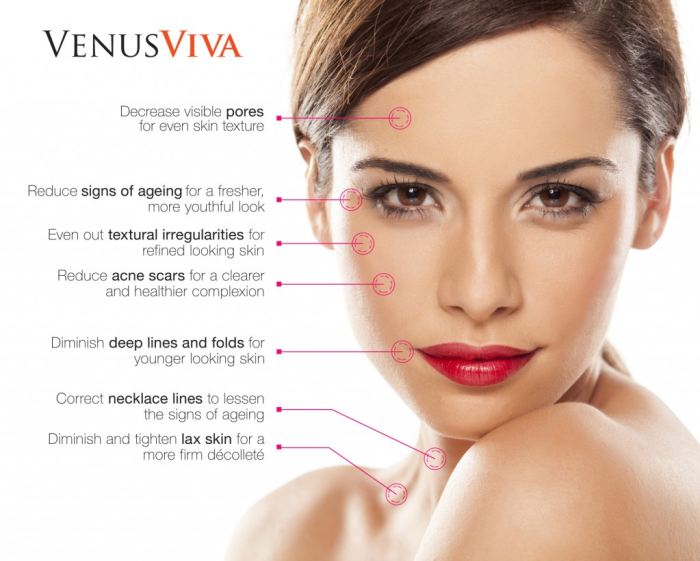 Venus Viva sends multiple fractional radiofrequency (RF) currents into the skin using patented scanner technology. This scanner allows for more uniform, safe and pain free treatments than the traditional RF fractional devices of the past. The energy settings are customized per patient and allow the medical professional to design a treatment that addresses the patient’s specific concerns. The RF tightens existing collagen fibers in the dermis. The RF current also stimulates collagen production cells (fibroblast) to make new collagen for the skin. The focused energy from the fractional Venus Viva device is used to send microscopic columns of RF energy through the skin to the dermis. The RF causes heat in the dermis injuring existing collagen thus stimulating the body’s own healing response, which is the production of new collagen. This process is what repairs signs of skin damage seen on the surface of the skin. Thanks to the nano-sized pin formation on the treatment head, the degree of tissue injury is greater in the dermis than the epidermis, allowing for little to no downtime. 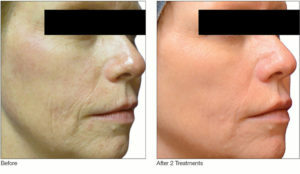 The Nano Fractional RF Skin Resurfacing is much more comfortable than lasers or chemical peels, and results in smoother, younger, healthier rejuvenated skin. 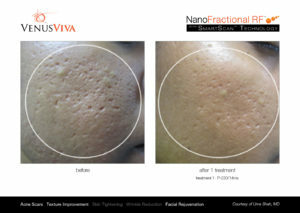 Who is a candidate for Nano Fractional RF Skin Resurfacing & Rejuvenation treatment? Immediately after the treatment, the skin will be red and feel warm which will resolve in a few hours. The degree of redness and mild irritation will vary. Post treatment care for your skin will be discussed with you during your consultation, as well as given to you after treatment. What results should I expect? How many treatments will I need? 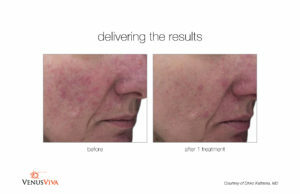 You can expect to have healthier, smoother, clearer and younger looking skin after one treatment but full results are seen with a series of 3-4 sessions, a treatment every 4-6 weeks. Contact us at (760)877-8747 inquire about specific pricing for a single treatment or a series of treatments and schedule a complimentary consultation.